Once upon a time, cars used to be all about mechanics. Now it’s all about technology–oh, and clever, tech-based marketing. Volkswagen has seized on this fact and is using it as a way of improving its vehicles, hiring talent–oh, and with a bit of positive publicity thrown in for good measure. 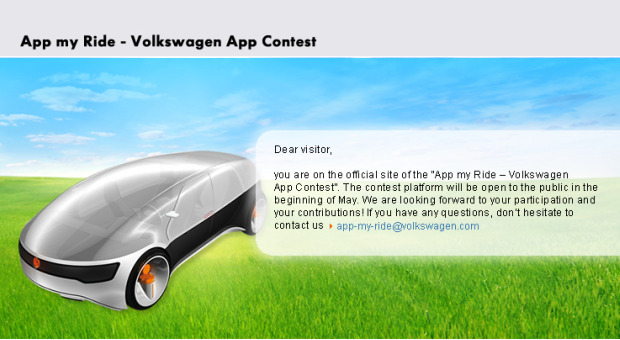 On May 3, it is launching App My Ride, a competition to improve its in-car infotainment systems. To join the Volkswagen app developers community next week, this is what you’ll need: an idea, graphic design of the UI of your app, and programming ability in either Adobe Flash or Flex. Most innovative app wins up to $18,500-worth of goods (let’s hope that’s not a gross of I Heart VW baseball caps, buttons, and hood ornament medallions), an exclusive trip to take part in the unveiling of a car at a motor fair, and a placement within one of the company’s research centers in either Wolfsburg, Tokyo, Shanghai, or California. This is a cunning plan indeed by Volkswagen. Cognizant of the fact that the best brains for the job are undoubtedly to be found outside the company–and said brains will probably have a whole host of ideas that they themselves hadn’t even thought of–they’re leaving other car manufacturers on the starting grid.